My reading habits have been sporadic and random lately. I’m like a springtime forager just eating whatever blooms and stalks I see after a winter of being too busy to choose my reading carefully. Zot! 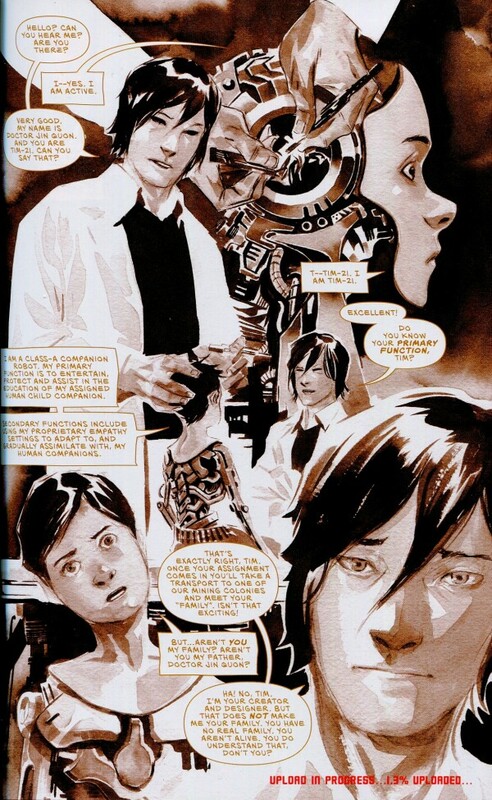 is the comic that probably put Scott McCloud, famed comics scholar, on the national map. It was his longest fictional work, and it was completed as he was starting Understanding Comics, the first of his books about comics as an artform. I confess to an inflated expectation, then, in regards to McCloud’s formative work—would it employ all of the formal tactics he codified in his critical writings? A much classier way to show a dream/fantasy sequence; no fluffy thought bubble required. Unfortunately, the story that these tricks serve vacillates between bland and melodramatic. 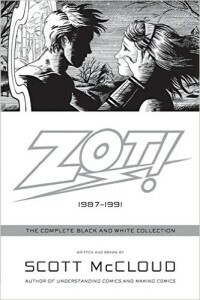 It follows teen science hero Zot, paragon of a parallel Earth, and his romance with pessimistic Jenny, stuck in our humdrum world. Her negative outlook is only exacerbated by knowledge of Zot’s fantastic utopia, and the tension in their relationship comes from her desire to escape her everyday life and Zot’s insistence that any world, any culture, is beautiful and worth saving. It’s a good starting point, but it often boils down to Jenny yelling or weeping while Zot looks on stoically. His childish naiveté fits his character, but it also means that no one really tells Jenny why leaving the less lucky of her world for the fantastic sci-fi life would be a gross exercise of her privilege. McCloud himself notes that some of his morals come off a little heavy-handed, comparing them to afterschool specials. This sentiment is coupled with a dismissive attitude toward the superhero aspects of the story, namely Zot and his super-science. However, the exceptionally melodramatic aspects of the series only get worse as Zot’s world is phased out and McCloud focuses on the everyday. It turns out that when a kid is flying around with a laser gun and rocket boots, it’s easier to mythologize the story—since there are aspects that readers know aren’t real, it can be fun to draw parallels and assign allegories to the cast and the story. When McCloud decided to take things in a “literary” direction, his characters and dialogue began to crumble under the weight of the issues he was tackling. Maybe the problem lies in writing toward those said issues—crime, coming out, divorce—instead of focusing on the characters. As a standalone volume, Tin Stars wasn’t great. 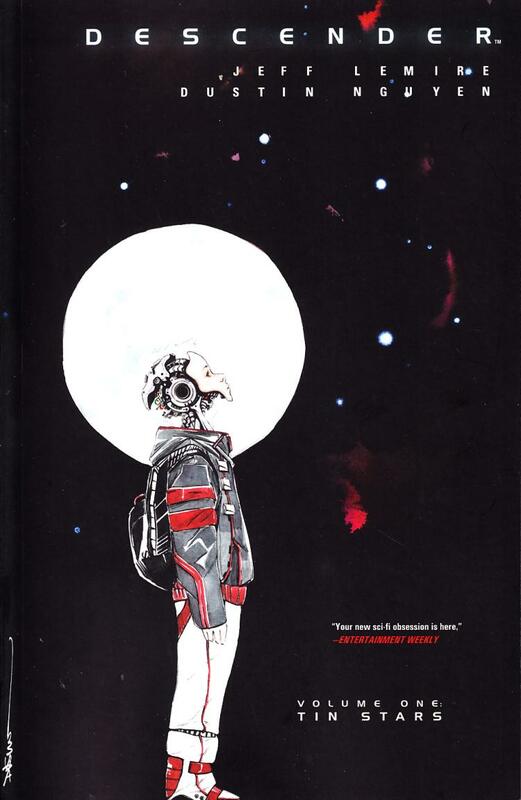 It introduces a futuristic sci-fi galaxy that hates robots after a mysterious mechanical attack. One of the last robots, a boy-shaped droid named Tim-21 who was made for friendship, might have connections to the event that kicked off the robot genocide. He and his dog-bot, then, are on the run from two factions in the galactic government. Who will catch him? Are their intentions what they seem? And what is Tim-21’s link to the giant robots that have irrevocably damaged galactic culture? By the end of Tin Stars, I found myself not really caring about the answers to these questions. Nearly all of the characters felt like bland stereotypes: the naive artificial boy looking for his human friend, the cute animal sidekick, the soldier woman with something to prove, the deadly thug with a heart of gold, the pig-like villains with no morals—it felt like an outline for a summer blockbuster. It didn’t help that the book was riddled with typos, from misspelling characters’ names to freely swapping out exclamation points and question marks. I’m 99% sure she’s doubting his statement, but with that exclamation point, she could be vehemently agreeing. Future volumes might develop these characters more. Indeed, the one character who gets an extended flashback, Dr Quon, becomes an interesting, flawed, and driven guy once his secrets are exposed. I’m just not sure I’m ready to wade through the typos and stereotypical dialogue to reach that point. 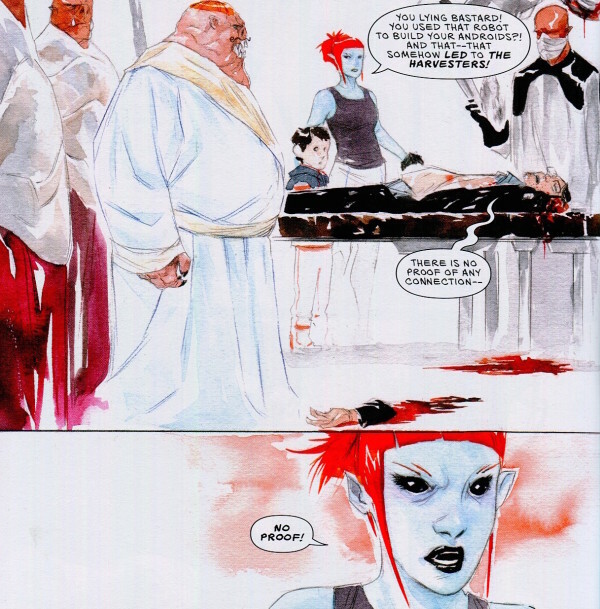 It’s too bad, too, because the art by Dustin Nguyen is beautiful. He makes even the most cluttered pages readable, and he uses spare brushstrokes that convey a surprising amount of information. His designs and facial expressions do a lot of the heavy lifting in the character development department. Despite being cluttered and desaturated, this page is perfectly readable. The story reads fast enough that a collection of 10 or 12 issues wouldn’t have been intimidating. If the characters get some development in the next few chapters, I’d have happily kept reading. Are these things considered by collection editors? All I knew about this comic going in was that it was about animal people. On that level, it did not disappoint. In fact, the book did not disappoint at any level. 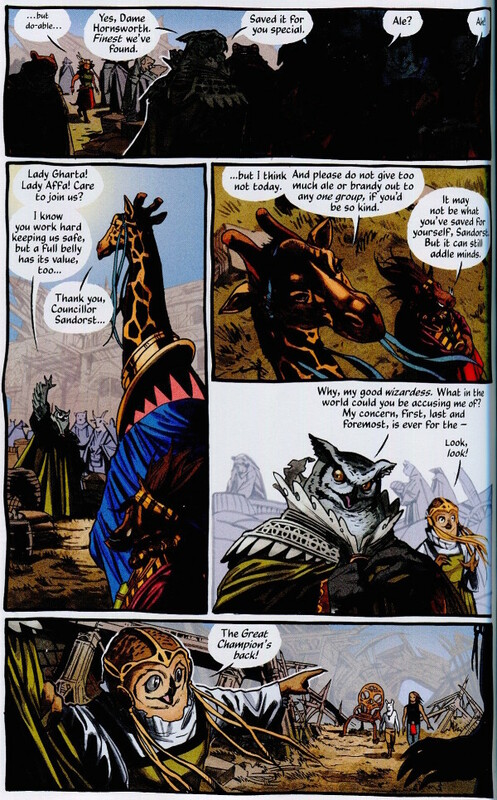 Despite having a cast of dozens, Busiek and Dewey use an inseparable combination of character design (animal choice, clothing, posture) and dialogue to establish personality and motivation quickly and firmly. The world—a place of dying magic, floating cities, and aristocracy and oppression—is explained at a natural pace. Some fantasy and sci-fi can feel like being led through a museum of the creators’ ideas; their worlds are static, relayed through bursts of exposition. 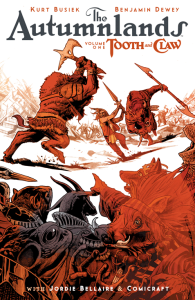 This is not the case with Autumnlands. These toys aren’t precious to their owners, and they’re freely deconstructed, deposed, and disposed of. There’s a central conceit to the story—a sci-fi twist to the Wizards of Redwall status quo that I hesitate to spoil—is almost just set dressing for the drama and politics of the rest of the book. Dewey’s art is slick and clear with lush ink work, and it’s impossible to talk about it without mentioning Jordie Bellaire’s color. There are a lot of sepias and earth tones, but it’s far from muddy; Dewey’s sharp lines keep things clear, and Bellaire uses splashes of bright color for the rich clothing, magic spells, and (spoiler warning) blood. The evil character at the top is surrounded by inky darkness that slowly gives way to browns and then bright colors as the hero returns. How about you, readers? What do you read when you’re grazing? And do you regret those choices later?